Overview – How Can Vapor Cup Vaporizer Help You? 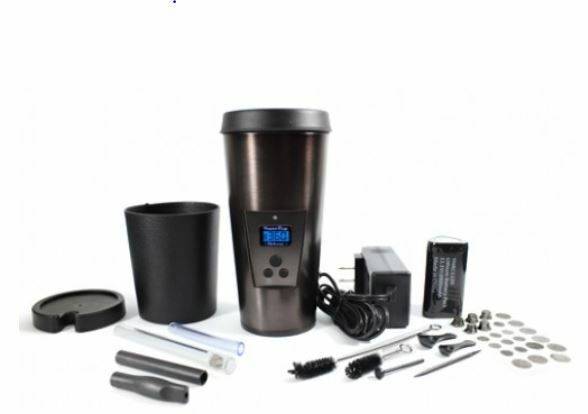 Vapor Cup Vaporizer will provide a good experience with vaping medical marijuana herbs. Discretion and privacy are very highly appreciated in a world where everything is exposed. The Vapor Cup Vaporizer will provide you with that discretion as you can take the cup shaped vaporizer with you in public places so you can continue vaping. 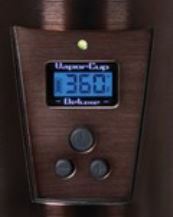 The Vapor Cup Vaporizer does this without compromising the quality of the vapor. That way you can take it with you places and still enjoy high quality vapor without anyone noticing. It looks just like something you would put coffee in. The device is one of the unique portable vaporizers on the market today and its battery can last up to 2 hours of continuous use. So you don’t have to worry about running out of juice. The vaporizer’s mug design makes it stand out on the shelf. You’ll be looking through rows of vaporizers and you’ll come across a device that looks like it should be in the mug and cups section. Except this device has a few buttons and a screen on the front. Well, that’s the Vapor Cup Vaporizer for you. When we talk about what gives the edge to one vaporizer over another we usually talk about components and specs. But here the product’s main advantage over other vaporizers is that it looks different. You can take this with you outdoors while running errands or to the beach and smoke your medical marijuana discretely. When it comes to temperature control, the Vapor Cup Vaporizer does a great job. Using buttons and a digital screen you can most accurately adjust your temperature. There are no limits to the heat settings you can choose from 200-to 400 degrees Fahrenheit. 1.There are more features to the device than just the way it looks, one of which is its quality. The device is made from stainless steel, l which makes it highly durable. 2.It also has a quick heat-up time, which you would expect from a portable device. If something is portable then it should be fast to perform. There’s no point in having something to use at a moment’s notice then have to wait for a long time for it to start working. 3.The Vapor Cup Vaporizer has a battery that’ll last you for 1 to 2 hours of continuous use. This doesn’t seem like a long time on paper, but it should be enough if you’re taking it to the beach or for a few errands. Perhaps there’s room for improvement though. If you decide you want to stay longer at the beach, then you can pack extra batteries.. Alternatively you can just wait until you get home and recharge the battery. 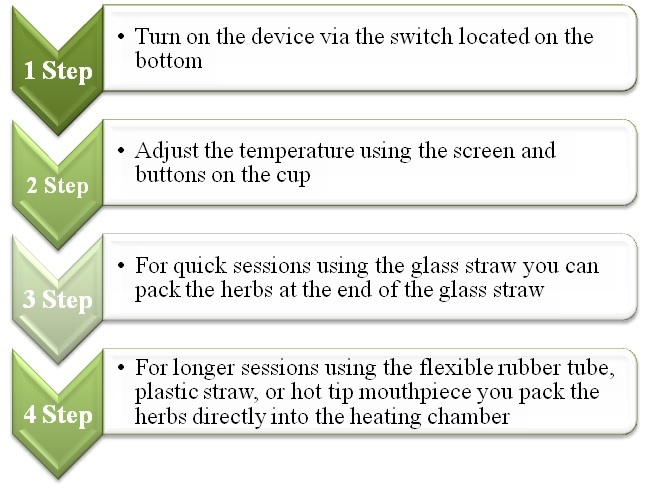 4.Auto switch off is another feature gaining popularity among vaporizers that the Vapor Cup Vaporizer has incorporated. It’s bad enough if you drive for 10 minutes and remember that you forgot to bring you vaporizer. But, it is even worse to have to worry about whether you left it on or not. The Vapor Cup Vaporizer’s auto switch off feature will ensure the device shuts off on its own when not used for 18 minutes so. In addition, it’s also easy to use and clean. 5.Unfortunately this device can’t be used to smoke marijuana or CBD oils. If you’re someone who is mainly used to smoking oils or concentrates then this will become an issue for you. The 1 year warranty also seems rather short compared to the warranties on other vaporizers. 1.Pop off the travel lid. 2.Remove the heating chamber after removing the seal ring. 3.Soak the heating chamber in alcohol. 3.Can be used to smoke medical marijuana. 5.Battery works for up to 2 hours and can be replaced or recharged. 2.Can’t be used to vape marijuana and CBD oils or concentrates. Customer support Vapor Cup Vaporizer is provided www.vapornation.com by e-mail, chat and phone line. www.VaporNation.com’s customer service will help you with any problems you face. Our final verdict is that this device deserves a 3.8/5. The design makes it attractive and unique without a doubt. But the device has a few flaws. The absence of a balloon bag system and the fact that you can’t use it to smoke marijuana oils or concentrates brings down its rating. It’s still a fine device if your main focus is on medical marijuana herbs and/or you want something that’s portable and secretive. Have you tried using Vapor Cup Vaporizer? If you have then please share your experience with other medical marijuana users to help the reach a decision on whether or not they should give this a try.